Thanksgiving bento have been interrupted to present the newest addition to our family: Prince Caspian! 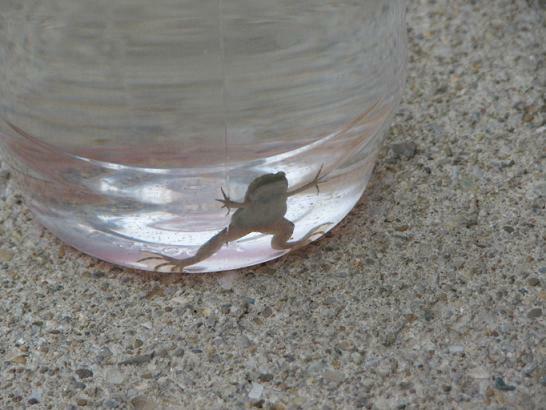 In the 3rd grade here the children study the life cycle of these small aquatic frogs and when they are done, if they have permission, they may take one home. Of course I gave permission! This is Kidlet's first pet! 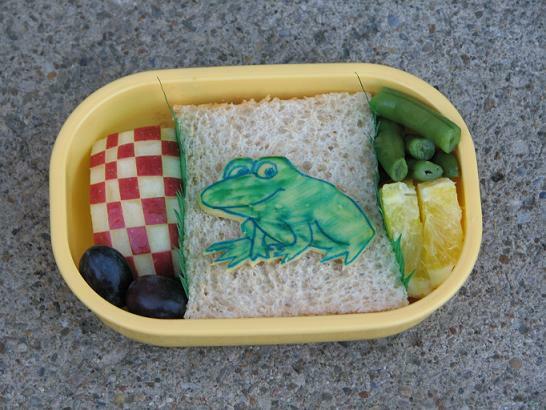 Kidlet has frog of cheese on top of tofurkey sandwich with checkered apple, grapes, green beans, and orange slices. Hi Jenn! I love your blog and have a fun award for you... please stop by to pick it up! I've given you an award! Go to my blog (http://lunchfitforakid.blogspot.com) to pick it up! Hi Jenn, I have an award for you, please come and pick it up at http://www.mamas3boys.blogspot.com.